The weekend brought news that Sean Yates was leaving Team Sky. 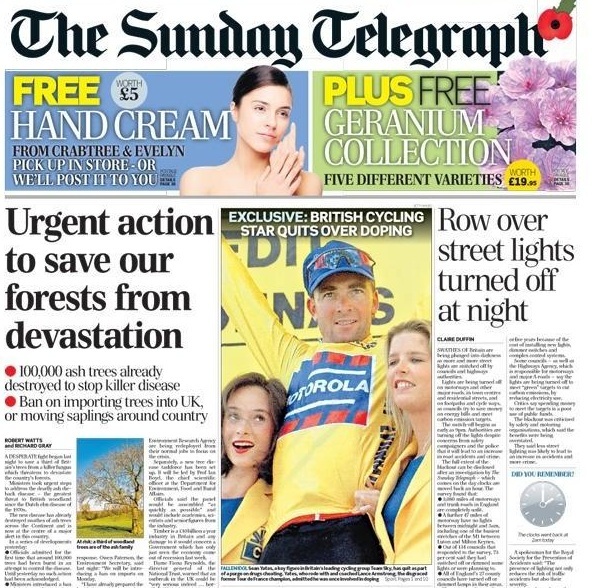 First it was for doping as London’s Telegraph ran the front page headline “Exclusive: British Cycling Star Quits Over Doping” next to a big picture of the big man. Hours later the team put out a contrary press release saying Yates “wants to move on, for purely personal reasons” adding there were “no admissions or disclosures that would have required him to leave the team”. The Telegraph also reported that Steven De Jongh is leaving but there’s no word from the team yet. It’s all confusing. Yates just happens to retire the moment the team are weeding out those with a suspicious past and if you’re joining the dots, don’t worry because The Telegraph said it was over doping. Either the press release or the journalist was wrong. Still whilst Sky get the front page treatment for trying to respond to the scourge of doping, other teams are trying alternative approaches and some don’t appear to be doing anything. We should be watching them as closely as we follow Team Sky’s declarations, no? There’s nothing to suggest Yates was involved in doping at Team Sky and his departure leaves a big vacancy in the team car. A popular figure in the team, he was authoritative too. Remember it was Yates who drove the team car behind Wiggins and Froome and worked the race radio to make them stick together. It is thought that Sky have now interviewed all of their current riders, and that all will sign the declaration. Let’s hope no rider decides to retire this winter. It was a sensible phrase but a bit off-message. I wrote at the time that either the team has zero tolerance or it doesn’t. You can’t have 0.1% tolerance. Which all brings it back to PR and image. The message is on clearing out the past and even good guys are cleared out. As the Chasing Wheels points out so effectively sometimes the message is both confused and confusing. Yet Team Sky are doing something. Faced with all the problems in the sport they’re acting. It is clumsy and costing them, whether in the financial packages given to departing staff and, perhaps worse, it even puts them on the front page of the newspapers for the wrong reasons as the D-word is linked to their team. Meanwhile you wonder what other teams are thinking, yet alone doing. Social media began to point out the worrying presence of Dr Geert Leinders on Team Sky and in time the mainstream media started asking questions and the doctor’s not had his contract renewed for 2013. So whilst Bobby Julich goes because of using EPO in 1998, Katusha have a team doctor who spent time in prison and has a criminal record for doping offences from the same year. Omega Pharma-Quickstep fire Levi Leipheimer but continue to employ Dr José Ibarguren Taus. Farnese Vini have Daniele Tarsi as their dottore, he’s got the Festina team on his CV. There are more medics and it’s before we consider other support staff, yet alone riders. Perhaps they are all reformed characters but they can work on one team but not another. We’re seeing the emergence of different tiers of teams as they get their anti-doping religion. Sky are the hardliners who ex-communicate the sinners and a similar creed holds Down Under where the likes of Stephen Hodge and Matt White have been cast out by Cycling Australia. Some teams offer a more redemptive message, for example Vaughters and his flock at Garmin-Sharp. There’s category where there are some good teams quietly doing good work. Argos-Shimano are open about doing things right. But France’s FDJ are more reserved, they run a good team but rarely ask for praise, perhaps because their high priest Marc Madiot has had a conversion on the road to Damascus, or at least a conversation with the police? It’s hard to set a sliding scale but Katusha emerge as pantomime villains given their crooked team doctor, a string of positive tests and now they’ve just recruited long time US Postal rider Viatcheslav Ekimov as the new team manager. Feel free to pick your own saints and sinners. But, and this can’t be stressed enough, it’s as much PR and image rather than philosophy and practice. If Katusha don’t tend to their image, that’s for them and maybe they just want to focus time and effort on recruitment or sports science rather than drafting press releases? There’s no requirement to join in, there’s no guidebook on what to do. As we can see, Team Sky get damned for trying whilst other teams carry on unchanged. Ultimately if teams want to tackle doping it’s a cultural job to explain to their riders that they can’t use outside doctors and instead can count on the full support of their employer to do it right. A team that offers expertise on training, nutrition and ensures riders want for nothing is one where riders are less likely to make the wrong choices. These long term measures count far more than press releases. One minute Sean Yates goes because of his past, the next it is health. It’s taken a long time for Yates’s past and Sky’s zero tolerance policy to collide and the retirement for health grounds is so coincidental that few can believe it. And if that that belief is weak then it chips away at other messages. But the Tour Down Under is just over 80 days away and the hope is that come 2013 the team that dresses in black will present itself as whiter than white. It’ll be interesting to see who they hire too. But whilst one team chases its tail, other sleeping dogs lie still. Sky will feel they get lynched for trying whilst their rivals attract no attention. Perhaps the competing approaches offered by teams is a good idea? As there’s no obvious remedy nor past precedent for the mess the sport is in, over time we will see how these methods work out, whether they win over sponsors and fans alike. Holding out for a perfect approach is pie in the sky stuff. There’s no right way to address all the problems of the past, combing cycling’s recent history is the equivalent of an archaeological dig on a landfill site. And whilst there’s no hygienic fix it does look like 2013 will be a defining year. Whether it is 1999 all over again or not remains to be seen. Exactly. We’ll see which of the approaches works better, especially over the long term. Speaking of the long term – I feel this is an indication that SKY is in the business of throwing money at cycling for a long time to come. The ROI on firing staff and having zero tolerance can only pay out a few years out, and ONLY if no doping stories come after the purge. Yeah, ugly, especially for those now under the proverbial bus but I feel a good indication of things to come for at lease one long term sponsor. Poor Sky and Yates. But if this helps with the message and the rest, maybe that’s the right thing to do. But is it? All this sounds more the PR rant of Sky the sponsor than Sky the team and I totally agrees that absolute hard-line probably wasn’t the right thing to do especially when there aren’t an universal approach across the teams. I hope “Good” Guys like Bobby Julich and Yates (if he did involve. Otherwise he’s just a Good Guy) can still get some involvement in cycling. Youth development sounds like a good idea. Finally, Telegraph’s acting appallingly this past weekend. Writing possibly self-conflicting pieces without a firm grasp on the truth, just to get them out first. This kind of Journalism cycling could do without. The hardline approach doesn’t quite work when you see the scale of the problems in the past. But to outsiders I think it’s a winner, those who only follow cycling from time to time will surely welcome this policy. Again, we’ll see how it works out, from the short term like who they can hire and longer term to how the squad’s image plays out. Exactly. The heavy-handed black or white approach may not work for Sky Procycling (or any of the grey areas that make up rehabilitation) but must be a requirement from the PR dept of SKY the multinational communications company. I would pretty much demand it if I were a Murdock. Unfortunately The Telegraph’s was acting as per normal. Don’t expect facts to get in the way of the story. Also, don’t forget that the Telegraph’s main competitor is the Times which is part of News Corp and so partly linked to Sky. Oh God, THAT Prince song just landed in my head. I can but hope, and chip in again for no 1999 repeat. Sorry. The sport certainly got a millennium bug. The Sky performance in 2012, remind us the USPS of the big years, that’s why we look at their “dope relation” with such attention. The symptoms of doping in a team, as described by Landis and Hamilton, are part of the Sky 2012 season. At one point, the USPS began to crack with a serious amount of supicious facts. Team Sky’s 2012 didn’t remind me of USPS, because I remember what the USPS years looked like. Wiggins and Froome vs Armstrong and Hamilton. The rest of the squad controling the race. In fact, USPS was weaker than Sky. Armstrong didn’t have a teammate with him on the podium of the Tour. And Armstrong never win all the big stage race from february to July in preparation for the Tour. And we know it’s not beacause they didn’t have all the doping product to do it. No, but as we saw from the USADA report, it’s a damn sight easier to give the out of competition testers the runaround than it is to avoid and in-competition test. And yet it was totally different speeds on the climbs now and then. Different competion too, for that matter. Compare Sky and USPS just because they sort of looked the same is too shallow. I had the same kind of reply in 2000-2005 when I was accusing USPS. At the time, people (mostely the americain Velonews chatters) were refering to Festina riders and Pantani, has THE DOPERS. Everybody knows in cycling that Micro-dose of EPO and AICAR are easily put under the radar in 2012 testing. @Dennis, the last time I saw a climber playing against the top contender on the Tour climb like Froome , it was Armstrong. Any serious criticism of Sky on this forum seems to be unwelcome. If Team Sky did not look like USPS then I don’t know what did. Don’t shed any tears for Sean Yates – it was jump or be pushed. Serious criticism by all means, but I’m not convinced that saying Sky looked like or reminded you of USPS in the Tour this year represents serious criticism. Wiggins himself said they were like US postal! Whats happend to the Wiggins of 2006 when he condemed rather viriciousfly dopers and doping? Since then he has rather changed his tune. Lance is a legend, a legnd that he supposedly never raced against. He has gone froma transparent attiude of f@ck the dopers to you w@nkers for talking about doping. Well excuse me Mr Wiggins, its because we have been bullsh!tted for years by you lot that we think like this. Sky have had a MASSIVE PR failure and its one of the reasons why they have been under the microscope so much over this. Correct me if i’m wrong but the Telegraph is a competitor of the Times which is owned by Murdoch. Therefore it’s no surprise to see the Telegraph take an economic view of the truth. If there was something sinister going on at Sky then getting rid of all the backroom staff would hardly be the best way to keep it under wraps. Though as Dave Brailsford and Tim Kerrisson are self-confessed workaholics we can probably assume that they’ll be awake long into the night…..
Sky and Oraca seem to be bearing the brunt of trying to do SOMETHING – even if that something isn’t necessarily sensible. Could quite easily see Yates and Jullich getting jobs elsewhere (Bobbie J to Garmin?). Zero tolerance seems self defeating, even as a PR stunt. My mail says OGE is trying to find a way to save Whitey. Whitey has been arsed by Cycling Australia but his position is ‘under review’ at OGE. I personally hope they keep him on. I’m not from the school that just because you doped during the EPO-era it makes you a bad person. Whitey is a stand-up bloke who knows the pressures that riders must face. I’d rather him educate the young riders coming up than someone that has no idea about doping. Astana surely push them a close second. in a way I am sort of enjoying the lynching for personal selfish reasons but what’s even more entertaining is the listening to the party line coming from all parties directly involved or not. Ha Ha let’s Party…..! I do hope someone is rounding up all the statements taking the moral high ground and freezing them along with the urine. Kind of like Tom Zirbel. Can’t really blame him for being upset at being cheated. I wonder how often he finished second to Zabriskie? Zirbel failed a drug test himself. Yes he did. For a prohibited substance he didn’t know was contained in a supplement. He cooperated and served his suspension. Don’t you just love how easy it is to create a hierarchy of drug offenses. The really bad stuff down to the innocent, you’ve got to be kidding me, stuff. The truly bad guys and the good guys that somehow got entangled despite their good intentions. The ones we love to hate and the ones we defend and justify. Lots of grey . . .
Was it Clenbuterol in Spanish beef? It’s hard to fathom how Sky keep botching their PR lately. While on High Road, Cav was much more controversial. This year I assumed the PR folks at Sky kept him quiet. With the Yates debacle and Wiggins lack of prep at the TdF press conference in July, seems like their PR team is no better than Sky’s classics team. I’ll write how I would spin from here, were I running Sky’s PR: Sky Pro Cycling has taken a zero tolerance policy towards doping in the sport. The team will have no association with doping past or present. We realize that this cuts us off from otherwise “good” people like Bobby Julich and Sean Yates, but it’s critical we take a stand. In their place, Sky will bring in experts from other disciplines who will look at the sport with fresh perspective and continue driving forward for additional marginal gains. I have trouble embracing Sky’s approach for one reason, and that is, as it’s been pointed out by Vaughters and others, is that it only helps to further the culture of silence and lies that has plagued cycling. The USADA investigation blew the lid off of that silence, however, widespread as it was, wide swaths of the sport are not directly implicated. I am not advocating necessarily that former dopers should be kept in the sport necessarily, I just think that policies like those being pushed by Team Sky create a perverse incentive in an area of the sport’s culture that has only served to perpetuate the doping problem. “Zero tolerance” too often equates to “zero brains.” Sky seems to be losing sight of the real goal: to make sure future races are clean. Disclosure and repentance probably are good enough, given the mess cycling is in. If we remove anybody who maybe might have, at some distant time in their past, maybe known something about doping in a culture riddled with doping, the Tour de France will be run by kids on tricycles. One question I’d like to ask is was Yates interviewed? If sky and Yates came to an agreement that he’d resign and not be interviewed as all other staff had been, then sky could legitimately say “no admissions or disclosures that would have required him to leave the team”. If so however, it is a little bit disingenuous. Matt White seems to be the best example of the difference in what should and shouldn’t remain in the sport. Doped in the past while on a team and in an era where doping was part of the program? OK we can look past that as you since worked for Garmin and advocated clean cycling. Refer a young rider to del Moral? Sorry buddy don’t let the door hit you on the way out. I think JV’s line in the sand on that one is correct. Whether the reason was the next VO2 test was 300K away, or something more sinister, we don’t need that perpetuation from one generation to another. It can be a good thing to have a few wise heads who have been around the block, and can steer young riders clear of dangerous waters. Those who use those wise old heads to ‘prepare’ the next generation need to be weeded out. The teams need to recognise one from the other. Also, that seems to mean that SKY have cleared Mick Rogers (according to the Telegraph). Not just Mick Rogers, but Wiggins too. I’m not suggesting he is dirty now, but he has a drawer full of Olympic medals won during the free for all drug era. It’s the same argument we have heard (and made) re: Armstrong: not only did he beat the best in the world, but he beat the best in the world while they were doped and he was clean. Doesn’t wash. I think Wiggins has been given a pass on his track years. And by establishing a zero tolerance standard Sky pushes him deeper into the closet with his skeletons. Vaughters has the better approach: acknowledge past sins. Seek redemption by preaching and living the gospel of clean cycling. Reform cycling by shinning the light into all the dark corners. At that time that he was very outspoken about doping and not very popular in the peloton because of it. Like when he was left to fry on a solo break on stage 6 of the 2007 Tour, as inrng wrote, the rent-a-quote Mr Clean. Then Moreni got popped and Cofidis left, whether you believe his disgust in the Guardian column he wrote during the tour or not, next year he signed with High road a ‘clean team’. Then he won all the golds at Beijing. I don’t know if he was/is clean, but comparing him and Armstrong seems a bit of stretch. How did the testing at the Olympics compare to that on the road? I just think we should try and give as full a picture as possible, rather than casual assumptions. Rogers indeed a really big question mark in my book. Brailsford claims that Yates WAS interviewed and that nothing untold emerged. I agree the SKY policy appears a little harsh, but if the sport is to be cleansed then it would be nice too see ‘other’ teams show the same determination. At the end of the day these ‘other’ teams rely on the inaction of the UCI, to take cover under the guise of silence or just claim to know nothing. My take on the situation is that Yates must have told Brailsford what ever he had seen/done during Discovery years/his career as a rider before and Brailsford decided to keep him nontheless. Only that Sky now decide it’s too much a risk to keep Yates. Omega Pharma-Quickstep easily rival Katusha for a dodgy backroom staff, surprised there aren’t more questions asked of them. I guess the Twitter Taliban are so focused on Sky they don’t have time to cast aspersions about other teams. SKY may not be the most blatant but they’re the n°1 team with a loud anti-doping stance at least when they started so it’s obvious they are the n°1 target on twitter. OPQS have a dodgy staff such as many World Tour teams such as Astana, Kastusha, Lampre, Liquigas, Euskaltel, Movistar, Radioshack, Vacansoleil, Saxo, Rabobank and even Orica-GreenEdge and BMC that very very few people mention on twitter. +1 on BMC. Great pedigree starting at the very top with Rhiis and Ochowicz. Yeah those evil OPQ and Katusha teams, liberating all those CQ points from the unforgiving clean Team Sky. Oh wait… is that 50% more points won by Team Sky this year, vs the truly dirty teams beneath them!? Marginal gains FTW!! To get a 2nd chance, don’t you first need to take some form of punishment over chance 1? That is an unfair characterization of Garmin’s policy, at least as I understand it. As long as Garmin’s riders and staff are truthful about their past, the team will support them. True, Garmin does not issue press releases detailing their riders’ past transgressions, but they have chosen to support personnel who speak truthfully to authorities. The effect of this policy should not be underestimated because it removes one disincentive to full disclosure. Today, in the wake of USADA disclosures, Leipheimer is out of a job but Garmin riders who confessed to similar activities ride on. Not only do Garmin not issue press releases, they also don’t tell the anti-doping agencies. Aren’t you a tiny bit concerned that VDV, Zabriskie, and Danielson all rode for almost 3 years for Garmin before they came clean to the Feds? That is not open and honest, and I can’t see how it’s different from omerta. Come clean, serve your suspension, and then we’ll give you a second chance. That should be Garmin’s policy. I think they’ve got Dekker to offer up more help to WADA but yes, all riders seeking refuge from other teams got jobs elsewhere with no questions asked. We’ll see if Sky take things further. Team manager Steven De Jongh has just quit the team after admitting to doping in the past, and whether he faces any consequences or ventures information about this. For the record, I’m a Garmin/JV fan, I just think the faults in their approach are glossed over very easily. Of all the teams I’m worried about, Garmin and Sky are near the bottom. In general there’s an element of picking and choosing which ex-dopers deserve punishment, and which don’t, which I’m a little uneasy about. Armstrong deserves his punishment, but why is there a feeling that Julich is unlucky? I don’t really get it. Well, I suppose Julich didn’t go around intimidating people. How is your team going to work? b) admit and take an unpaid vacation for a couple years. Option 2b is currently available to all dopers, but how many are taking it? What is the incentive for joining your team? Why should my team (which I don’t remember setting up) pander to dopers? How about the incentive for not doping is you get to ride on a pro cycling team, free from the pressure of doping, and you get paid to do it. Thanks, I saw something saying Festina but you’re right. Quite a list of teams for his CV. TBH I’m not much exercised by whatever Sky’s PR is doing or not doing, mre interested in the bigger picture that INRNG mentions ie what about the others and what they are doing. And I suspect the fabled “internet bampots” have a major role to play here – so when sportsscientists.com do an watts/kg analysis of the riders in the recent Vuelta (not done yet, unfortunately) or INRNG does as he’s done here and prints a list of dodgy docs still practising in cycling that information will have a significant impact on perception of those teams, which will lead to greater scrutiny and hence more and more pressure on them. I think INRNG suggested publishing blood values for educated amateurs to study, which is part of teh same effect. The bad guys might have better paid doctors but I don’t believe they will be a match for the sheer volume of good guys putting them under scrutiny. It won’t be fast but over time will have an effect. The names of the dodgy docs are interesting and internet scrutiny is good but sometimes there’s too much opacity among WT teams. For example in the case of GreendEdge you don’t know the doc, you don’t know if White is sacked or not and in fact you don’t know anything. All you know is that this new team scored 50 victories during its 1st year (many of them in WT) and its DS crew is loaded with guys a doping past: White, Stephens (ONCE,Festina), Algeri(Polti, Milram), Lapage(Astan,RockRacing), Nardello(Mapei, Telekom). For the rest nothing to see. Yes, I agree. My feeling is that many (most?) teams won’t volunteer transparency, it will have to be forced on them. This will happen by internet bampots doing the digging then mainstream journalists asking the questions in public – the mainstream journos generally don’t have the resources to properly research a speculative story but when someone else has done the groundwork they will follow it up. Didn’t this happen with leinders at Sky, a twitter story then more mainstream attention? Interesting piece in the online NY Times this morning about the role of, as you call them, internet bampots doing the digging, and their role in the Armstrong saga. Something of a mea culpa and a good read. I think you’re missing a major point with the Sky departures. Assuming anyone confessed to some doping involvement they aren’t being punished just because they doped. They are being punished because they doped AND joined an organisation which had a clear policy against hiring dopers. They joined the team under false pretences. Lying to your employers, or not telling them everything they need to know is generally frowned upon. It would be like faking my CV to get a job and then expecting that if it wasn’t discovered for 10 years they’d be OK with it all. Cycling needs to stop acting like it’s some alternate universe. Fraudulent accountants don’t get hired so they can teach new recruits what NOT to do; murderers don’t get a fast-track to the police academy because they know the tricks. While the sport is filled with people who know they can cheat and lie and deceive for as long as possible it will never be clean. It only takes a few of them to turn others to the ‘dark side’ and even if they don’t actively push it they are still an example of how you can have a successful career based on doping and essentially suffer no consequences. That’s true but we’ve had a systemic problem where, say, 80% of accountants were being fraudulent in the past so trying to hire people was difficult. Team sky are only being hoiste by their own petard because they claimed to be cleaner than clean and by inference implying everyone else is dirty. If they were more humble then the knives wouldn’t have been out as sharply. It’s the double standards that are the issue. I think it’s a huge shame that there is no room for leniency in the mr brailsford spinning class but if that’s they’re rules ten they need to stock by them or face the backlash. That’s not how I see it James. They aren’t demonstrating any double standards. They are demonstrating best business practice by saying if you join us under false pretences (and they were set up from the outset to be an overtly clean team) you will get the sack which makes everyone else’s business practices look poor. They have effectively switched on a light and everyone from the interested fan to the twitter taliban has been attracted to it because it’s easier to scrutinise their problems. Not quite so easy to see Katusha’s at one extreme or even Garmin’s at the other. Does anyone really believe this is all David Brailsford’s choice? The ‘sign-this or you’re out’ approach? I would put money on this being the sponsors putting pressure on the team to act. Sky have such a big involvement in cycling in the UK now, with the Sky rides, sponsoring the national team as well as the first Brit winner of the Tour, that they probably feel they have to do something to make a statement. It’s unfortunate for guys like Julich and others, but you can’t help feel that chickens are coming home to roost for pro-cycling. And this is why the UCI, and Henricus and Pat in particular are so culpable for presiding over the madness. People are saying that Sky’s policy just encourages people to stay quiet. The evidence though is the opposite given that three members of staff have already departed. Personally I really feel sorry for Team Sky. If they have anyone “dodgy” on their team people will be talking constantly about how they are clearly dirty and that having person x and person y on the team proves it. By getting rid of all those people they are eliminating that problem. While JV’s methods at Garmin are seen as a good alternative I disagree strongly. You go to him, admit all the dirty things you did, agree to not do them again, then sign a nice fat contract. The problem is that you don’t take the ban that you deserve for cheating. If they want to sign for Garmin they should admit what they did, co-operate with the authorities to get a reduced ban, then join Garmin afterwards. I would be very happy to see more teams take on Sky’s policy. Bobby Jullich may be a nice guy, but by taking EPO (irrespective of how rampant is was in the peloton) and getting top 10s in both the Vuelta and Tour de France he was able to command a wage that most would probably dream of. He was never punished for cheating. Now he has lost his “dream” job, but no doubt with a great severence package. Yates retired. He didn’t admit to anything. If you ban everyone who doped the Sky will fall! And Wiggins will be out among others…. Perhaps only French teams will be left competing among themselves… Who would have thought that “Le Tour des Francais” that often maligned segment on french TV during the Tour was — in retrospect — a better indicator of who was actually in the lead? I did not! When did Wiggins dope exactly? And Houanard isn’t French, riding for a French team? Raise your hand if you think Wiggins’ Olympic track medals were won “cleanly” during a “dirty” era. Don’t know. I guess the trackies didn’t need pharmacological help because their races were all short and flat. Much as think you are talking rubbish Oliver, I did enjoy your Rapha ‘Kognac’ dig. One should not overlook the cultural aspect of this issue. Inring points to the Russians as one example, and indeed it seems that each cultural milieu has its own unique response to the current situation. It is the anglophone teams, riders and staff that seem to be reacting most dramatically to the USADA disclosures – themselves an anglophone phenomenon. McQuaid v. Kimmage is the emblematic rallying point for public trial of alleged UCI corruption, and Greg Lemond leads the charge. Outside the anglophone world reactions are varied. Has anyone heard a spanish-speaking rider or team director express support for broad reforms, or praise riders for speaking truthfully about their actions? The French, for the most part, seem to have made their peace with this issue a decade or more ago. Italian, Dutch, German, Danish, Kazakh, Belgian, etc. etc. each are at a different stage in their evoloution with respect to the legal, ethical, sporting and public relations aspects of the doping question. The conclusion to be drawn is that “change” must be driven in each cultural milieu along lines specific to that milieu. Some are further along than others. As far as I see it, it seems to be mostly a cultural issue what decides the approach the teams take. Apparently, cycling’s doping problem is just much less of an issue in countries like Russia, Spain and Kazakhstan. Accordingly sponsors of teams from those countries will value results still more than the ethics of the team. I think for teams from the US, UK, Germany, France or the Netherlands there is just no way back to dope smelling team rosters because that way they will lose their public an corporate support, in Belgium and Italy there will probably still be more margin to do so, whereas in Spain and the newly entering powerhouses from the East, the mentality is completely different, and they will probably just do the required minimum to get a WT license. Because of that it is now so important that we will get a new leadership of this sport that will actually support the teams/countries that are ready/willing to go ahead. But i’m not very hopeful that will actually happen. Like Justin above you make a similar point. And I tend to agree, different countries have different attitudes just so long as we don’t assume everyone within the borders thinks the same. But they meet universal rules from the UCI and WADA. Universal rules are the starting point. Attitudes toward the rules will vary. One lesson vividly imparted by Tyler Hamilton’s book his how the athlete’s ethical standards can be subtly manipulated by the supporting entourage of directors, doctors and trainers. This manipulation occurs in private moments, where the personal connection between rider and support staff assumes more importance than the rules. There is not a WADA official in the room when the exhausted rider at the end of his forces is offered an illegal recovery product. It seems that teams develop an ethical culture that reinforces the behaviors in these moments, for better or for worse, and the evolution from a culture that accepts illegal behaviors to one that discourages them proceeds along different paths. We are witnessing this now. Genuine question: Lots of people offering fairly certain views here about Wiggins and Sky being dopers – I agree that we have to be sceptical given history, but I think assertions are dangerous – just as they were when used by history’s apologists. Can one of you lay out a balanced view of the evidence please so I can be convinced? Otherwise I will have to dismiss you as cranks at the opposite end of the spectrum to the “Lance has passed 500 tests/wouldn’t pollute his body” mob. Official. De Jongh now out of SKY after admitting doping. For Drew . . . I share your questions, but am also a confirmed skeptic. I’m one of the guys asking questions about Wiggins. When Wiggins went off on the press during the Tour I could feel his frustration at being unable to prove a negative. How can a guy prove he is not doping. Bio passport and clean tests help, but still . . . Assertions can be dangerous sometimes. They can also poke holes in flimsy stories that don’t really hold water when examined closely. Armstrong insisted he was the most tested athlete in history and never failed a test. But early on the skeptics were making assertions and charges: In 2000 and even earlier the naysayers were getting shouted down by the true believers who were certain Armstrong was clean. As more of the top racers of Armstrong’s era were caught, it became clearer to the skeptics that all was not right. He was beating the best in the world while they were doping. He was winning both TTs and big mountain stages. Not just limiting losses, but winning. Dominating. His times on the base line climbs were astoundingly fast–Pantani fast. Who else had done that? It didn’t add up. All the while passing his drug tests. Still, it took 1000 pages of an USADA Reasoned Decision to convince most that he cheated. Some still believe his story and cry “no hard evidence” and “never failed a test” when challenged. For me the starting point is always the “sniff test”. If it doesn’t smell right, I get skeptical. My nose isn’t always right, but I’ve learned to go slowly when something stinks. 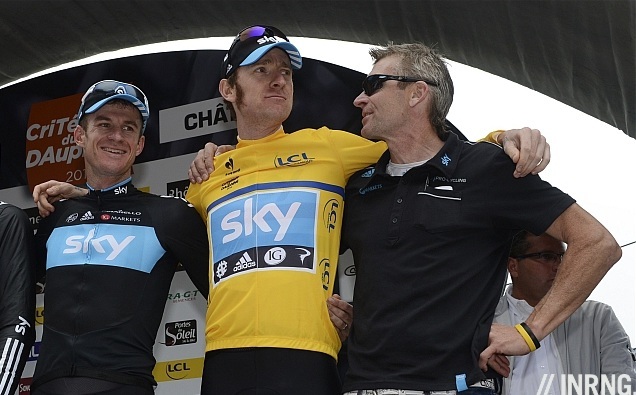 Wiggins and Sky looked positively Postal during the Tour. Four or five guys left on the front when the lead group was being thinned to the very elite guys. The performance of his team mates was astoundingly good. Riding beyond our expectations for each of them individually. And all of them doing it. But their climb times were modest. Don’t know . . . But what has me wondering is Wiggins’ track legacy. Lots of Olympic medals won in a very dirty time. Not much talk about the track cyclists during that era, but do we really think they were clean? And if they were not clean we ask the same question we were asking of Lance: How does he beat the best in the world when they are doping. So I can’t “lay out a balanced view of the evidence” just as nobody could early on in the Armstrong saga. Hard evidence is elusive, and slow to come. Still, it doesn’t pass the smell test. Sadly, very little of that era passes my smell test. So now I ask for openness rather then zero tolerance. Let’s come to terms with the past and be reconciled to it rather then think we can root out all the bad actors and banish them. Some are incorrigible and need to be banished forever from the sport. Many though, have much to give to the sport. Fair enough, don’t disagree with any of that. The only arguement I have for Wiggins being clean and still being able to beat the best in the world is that British Cycling always took the track very seriously and ever since Boardman they’ve had a distinct technical advantage over the other teams. BC put more money into their track program (and still do) than even the likes of the US so they’re always going to get more medals out of it. I like your reasoned agruments for being skeptical. Track cycling is a very small pool where there a lot of low hanging fruit to be picked. There are so few countries with decent facilities that there aren’t just marginal gains to be had but game changing advantages. Team GB showed this in the Olympics targeting expensive sports that most (even 1st world) countries can’t be competitve at: rowing, sailing, equestrian… track cycling. Looks like he picked the wrong gear and blew himself on the climb. People do make mistakes. It’s so hard to know how to interpret change. I too sit and wonder about guys who have improved – are they now prepared or have the others dropped back? Data (speeds, etc) says at least part of it is the latter. History says be wary of assuming it is 100% that. All I ask is that folks try to retain some perspective rather than go on a witch-hunt – it’s all starting to feel a bit Red Menace now and that can’t be good for anyone. There were big red flags other than dominance for Armstrong and USPS. And I disagree that the dominance is the same – it wasn’t the whole team day in day out all day. Thanks for mentioning the blog! It’s a good point to raise about Sky taking the heat when others are doing less or, at the very least being less vocal about it as a selling point. – Sponsor silence. The funding for the team comes from Socially Responsible Business pot at BSkyB, so the team do need to be seen to be cleaner than clean. But strikes me as odd that the voices from within their camp have been so quiet. That suggests to me that there is sponsor pressure coming down towards Brailsford. – Rider silence. I’m struggling to think of any Sky rider who has vocally supported the policy. When Usada/Armstrong broke, the PR for at least two of their British riders mentioned that they’d been advised to keep their heads down and stay well out of it (I’m not going to mention which as it seems a bit unfair given the context, but it was fairly public). – Point of difference. While Sky’s policy outwardly is significantly different to some other team, I find their execution somewhat troublesome. Behind the ethical stand, they seem to be still the same old-fashioned “getting rid of people whose past/present has become awkward for them without being clear about the circumstances”, which is pretty much what everyone else has done and continues to do. There’s a hint of the way Rabobank pushed people out of the door with a cheque in their hand (albeit at a later date) during the Rasmussen affair. Likewise Riis only shoved Basso when it became inconvenient to keep him. Not to mention the Katusha vs various. I guess that’s the problem when you start backdating your policy. – Questions now being asked that they didn’t want asked. Let’s face it, a huge swathe of fans outside the sport are now looking at the departures and asking whether Sky were clean in the first place and what else they might be hiding. Now that wheel is turning, it’s going to make their lives even harder. With the notable exception of Yates, I think the admissions from the others that have left have been pretty clear. I enjoyed the blog piece, a good take on things. At least Sky got the memo that British cyclists weren’t doping. Funding comes from their marketing department. Sky are / were clueless as far as cycling is concerned. They relied heavily on Dave B / Fran Millar and basically hung on their every word. If they had done due diligence themselves they would not be in this situation. Dave B has recruited people he knew had previous, to think otherwise is just naive. This whole exercise has been a PR car cash for them and they are trying unsuccessfully to get out of this tail spin. Loads of skeletons still in cupboards from the top down, sky have opened the floodgates and can’t stop it now. Would anything they said not have turned in to a PR car crash in hindsight? I think he was just being cocky and pandering to the press by using the ‘zero tolerance’ line. This exercise, from what I understand, is causing huge amounts of turmoil in the team, a team that goes through a culling like this will take time to heal. There are riders that Dave B knew were dirty. Or if he didn’t know, felt certain enough to refer to them as cheats to people in conversation. There were also riders who from his role at BC knew had ‘history’ yet signed. Point on rider silence – what do you expect from a group of under 30’s who all they do 24/7 try to get better at riding a bike? Most haven’t got any education past finishing secondary school. So to think that they would have any lucid thoughts on the topic that wouldn’t get them in to hot water or limit there hirability in the future isn’t realistic. Hence, most are best placed saving there opinions for when they retire and I say this as someone who would love to hear their actual thoughts. Nobody is threatening the NFL over doping in the USA…I think the Spanish attitude towards it may be similar, the old “ya gotta do what ya gotta do” to compete – same line spewed out from so many others as well, so the North Americans probably shouldn’t be so quick to call another country the land of cheats? My big question for SKY is why did they wait until AFTER they won cycling’s biggest prize, handing Uncle Rupert and Co. a huge publicity gain for their expenditure – if they so anti-doping? Just like most, they claim to be anti-doping but the truth is they’re anti-doping SCANDAL, which is a very different thing and pretty much the way the game’s been played for a long time. Too long. After Armstrongs final fall. A lot of Twitterati and Bloggers who had run play by play accounts of the USADA investiation found they needed a new enemy. Thus they turned on Sky. Not because there was anything tangiable, but because they love to stir up a Hornets nest. (I even wonder if some of these self appointed commentators actually ride bikes) I wouldn’t even mind if there WAS some dirt on Team Sky. All it appears to me is that they are succesful but also clumsy and remarkably not PR aware with regards to social media. Please. Sky at the TdF was as dominant as any team since USPS. They even had TWO riders on the podium, one of them had never done anything of note on the pro scene until the prior Vuelta. The guy who won was around for the generation that is being shown to have doped almost to a man. Marginal gains…….remember when training smarter was how LA won 7 tours? I love how you can tell the Brits from the rest on here. The Brits are where Lance fans were 10 years ago, can’t believe anything bad, incremental gains and such. They think Sky is doing everything right, point fingers at the rest. But this Yates thing was a joke. And why does no one question Froomes performance – basically wins the TDF and then cant even podium at the easier Vuelta. The Brits would probably tell you that the Vuelta wasn’t exactly easier, Froome was probably very tired by the Vuelta and they would also stress that poor Froome was competing against a bunch of doping Spaniards. I don’t think it’s a British thing. He was on form for the Dauphiné, did the Tour and then the Olympics and couldn’t keep going until the Vuelta. Haha, I was being sarcastic and holds pretty much the same idea. Nice generalisation Soab. Thanks for that. I think most people have a heavy dose of skepticism laced with the reality of cycling culture but of course we can’t chuck around the cheap and easy national stereotypes around from the inside as you so clearly can from the outside. And I just read Servais Knaven is a director at Sky!? He spent 4 years at Quick Step along Museeuw and he’s clean. Oh brother. I don’t wat him fired but thinking Sky will be 100% doper free after this purge is crazy. Rogers? That’s just awesome. It seems the Cycling News ‘Clinic clowns’ have now infected this excellent blog… Their ranting, swearing and finger pointing just adds so much to the discussion… And dont try to draw parallels between Wiggins and Armstrong. Strong evidence (you know, witness statements, suspect drug test results etc) existed to support the well-founded suspicion around Armstrong. There is no such evidence against Wiggins or Froome for that matter. I can understand cycling fan’s (and far more importantly clean pro rider’s) disappointment about whats happening in the ranks of pro-cycling but what some of these guys dribble is so speculative that it’s ‘News of the World’ worthy… That’s almost ironic. INRING please dont let this blog slip down to the bitter and twisted level of the Clinic. Are you serious? Because I disagree with a baseless conspiracy theory perpetuated by some very sad individuals, I must be British? I don’t like groupthink, this went a long way to creating the Armstrong mess as sceptics were hounded out and silenced. Any points and arguments on here are valid so long as it’s part of a debate and conversation where you can put your case, preferably with intelligent evidence, rather than a shouting match. Not much coming from other teams is there. Are they all still on holiday? I think a large number of people (some call themselves, witnesses) already know the answer to that question! If there’s not a SKY announcement about SS very soon, I think I’m going to turn my back on following pro bike racing. I’d rather support honest amateurs than waste my free time on the farce that pro cycling has become. Maybe I’ll just tune in for the worlds RR instead of taking the kids to the panto…. The whole SKY thing started out as laudible ideal and has just become an embarrassment. It’s been badly handled and now they’re reaping the benefits of their inept approach. They keep asking us just to trust them, when each month they do something else (or even just nothing) that further erodes any trust. I don’t think any of the current ProTour teams can really claim to be a clean team. To try and convince fans that you are, is just an insult to their intelligence. Garmin are on a track towards clean and I like Madiot’s efforts too, but there is still a way to go. For the future of the ProTour, I hope they have the stomach to continue further down these paths – it’s been so bad, for so long that teams will now have to set an exemplary standard if we are to believe in them. I do wonder why SKY are the focus of so much attention. They at least appear to be trying to be positive about the situation – right or wrong approach. I would rather see some questions being raised about other teams which are absent by their silence. Astana and Katusha have been mentioned but Movistar is also right up there with questions to answer. Its’ not just their silence – its’ the riders, medics and management associated with them that should be drawing some attention, I would suggest from the UCI. Until the UCI makes some serious effort to level the playing field, we are left with people asking questions and making assumptions that at present have no answers. Not good for the sport or fans. Wonder who is leaving sky cycling today! Dowsett signed the deal months ago, before the USADA report. A well-kept secret but quite people knew about it. So be careful not to put 2+2=5. To be clear, I agree completely – the witchhunt I refer to is the one that appears to be building amongst some of the comments here. I shouldn’t have descended to sarcasm. Like you inner ring, i’m not convinced by Sky’s approach, although I still agree somewhat with the commenter who pointed out that Sky declared a position well in advance which ought to entitle them to apply the boot where they were lied to. The question for me is whether they still have that right having apparently been wilfully naive in some cases (although I think hindsight may be exaggerating the total extent of that). Either way, they clearly needed to have been more exacting to begin with. Although I suppose they couldn’t have predicted the current earthquake and the pr/credibility nightmare it’s created for nearly every person directly in the sport (whether or not they know it yet – can anyone be free of suspicion, be it winning too well, ever changing form, maintaining too much form, knowing the wrong people, saying too much, saying too little). What a mess! Actually, thinking about it, Sky should have exactly predicted the current earthquake. Starting with lofty ideals they should have considered some sort of scenario on this scale. I find it a strange move for a Brit to move to a spanish team. Especially when you move from one where there is zero tolerance to a team where you will be working for a convicted doper. I would think that chances at Sky would be limited for Dowsett so he may have a bigger role to play at Movistar. I will be interested to see how it all works out for him. In regards to who is clean and who is not I think that we will have to wait 10-15 years to find out all the answers. The best indicators for me are the times up the climbs and how they compare to the previous era. Movistar have business interests in the UK, they own O2. They wanted a Brit rider and Dowsett is ideal being a national champ and good in the media. Reading through some of the comments here claiming that the Sky policy is a PR disaster. Erm…actually its not – at least not with its main target audience. This target audience is not those of us who religiously follow the season from Jan to Oct, then maybe switch to watching some cross until the European season starts up again. Its not the audience who frequent blogs like this and interwebz forums. Its the general public who have been taking to their bikes, some of them going on the Go Sky rides, inspired by the GB trackies, the Olympics, Cav’s success in Copenhagen last year, and Team Sky this year winning the Tour. Its people who got back on their bikes after years away from them, or who’ve stomped down to the local Evans, Halfords or LBS to pick up bikes for themselves and/or families. Its people who’d never even regularly watched the Tour on the tv before this year, but are now making plans to go out to France next year to see Cav, Wiggins and Froome ride. And whether some people like it or not, this policy is going down very well with this target audience who’ve been shocked by the revelations about Armstrong and le dopage in the sport, but totally approve of this strong line being taken. And that is a fact. It’s simple. Sky are under attack because they are the winners. Natural suspicion of winners is appropriate given the current state of the sport. Now what is the number one rule of publi relations crisis management? That is why we are seeing a proactive team sky. Thy are taking control of the message because the alternative would be worse for them. Sky is not under attack because they are winners. But because their cyclists are unbelievable regular. Believe me, the difference in doping is not longer made bij using (detectable) big doses of EPO. But by using coctails of small doses of hormons, (not detectable) EPO-like products en Cortisone leading to a better recuperation. Teams running a grand tour without knowning any breakdown are very suspect. short term loss, long term gain. its the rest of the teams which are in trouble here. if the no1 team and their sponsor have a zero tolerance policy, how can the uci, when they meet, not apply it across the board. sky have drawn a line in the sand, the uci can’t draw their line behind sky’s. surely the uci would be leaving themselves wide open. The statement from Sky was very specifically worded: “Sean Yates has made no admissions or disclosures…”. This is very different from “Sean Yates assured us that he has never been involved in doping…”. To me, the implication is obvious – Yates didn’t want to make any confessions, nor did he want to sit there and tell lies, so he opted for the “leaving for personal/health reasons” parachute that was offered. It’s clear that Sean does have some major heart problem issues, and it doesn’t surprise me that he would rather quietly bow out rather than face the media storm from his certain knowledge and participation in the doping practices at Motorola – including his then protégé Lance Armstrong in his already-doping pre-cancer career. So while I’m a bit pissed off Sean Yates is insulting my intelligence a bit here, I’m kind of sympathetic for the man. I wouldn’t want him to go to an early grave from a sport that’s clearly worn his heart out already, and would stand a good chance of breaking it.